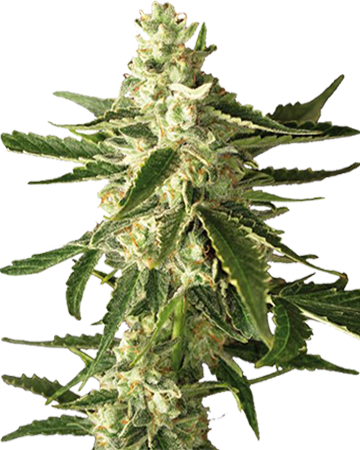 White Widow feminized cannabis seeds deliver almost instantaneous mental effects such as more defined perception of sights and sounds, and a burst of mental energy. After awhile, the sensations mellow out into a light body stone that can help you relieve anxiety, insomnia, cramps, chronic pain and migraines, and even ease Multiple Sclerosis and seizures. 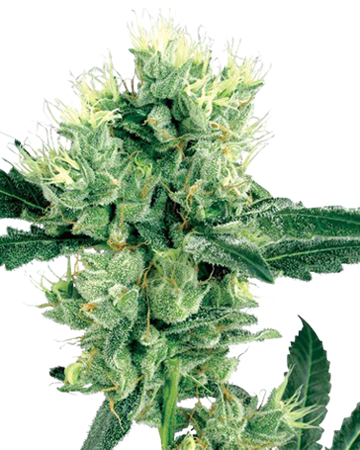 When consumed, pine and citrus-scented White Widow causes almost instantaneous mental effects including more defined perception of sights and sounds. Early on, these sensations contribute to a burst of energy that makes you want to go and get things done, at least in your mind. After awhile, the sensations tend to mellow out into a light body stone. 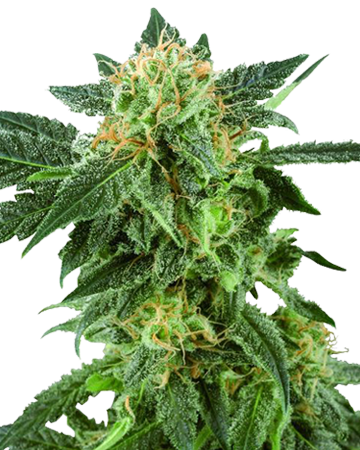 Powerful White Widow cannabis seeds are credited with treating anxiety, insomnia, cramps, chronic pain, migraines, and even Multiple Sclerosis and seizures. Recently, research has begun exploring the strain’s ability to help people suffering from the blood disease Hepatitis C, which can lead to liver conditions and even cancer. 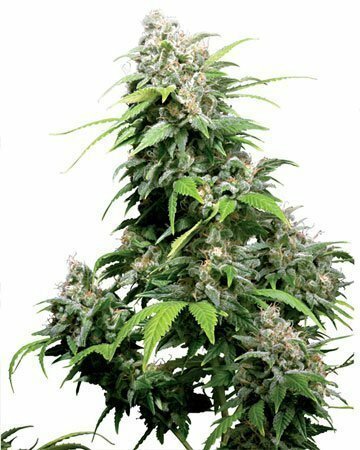 White Widow cannabis seeds will generally deliver the best results when germinated and planted in an indoor, hydroponic environment, with or without soil, though with the right conditions, this hardy strain can resist mold and colder climates, for a decent showing out of doors. 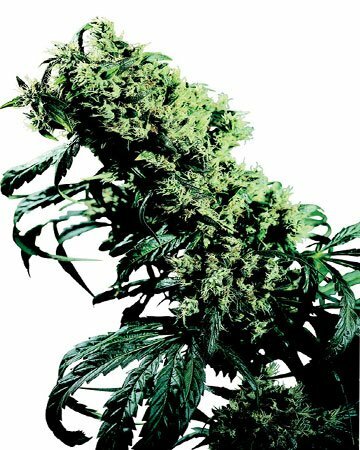 When grown inside, White Widow can deliver as much as 500 grams of harvestable flower per square meter, and it is important to remember all those resin-coated sugar leaves offer therapeutic benefits, as well. 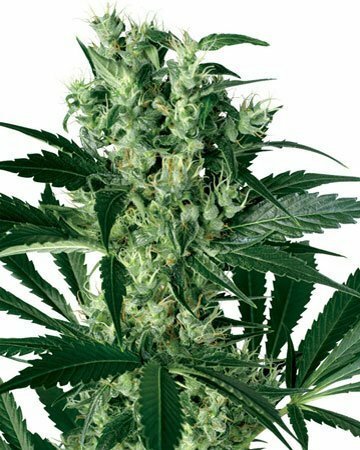 Allow for a flowering stage of eight to nine weeks, then enjoy your powerful results for all your medicinal or recreational needs. 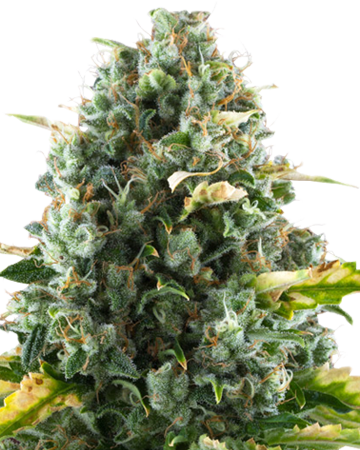 Get all the details on this fantastic strain from our White Widow Cannabis article! Try White Widow feminized cannabis seeds for a burst of mental energy. 3 for 3 beautiful baby’s looking amazing! 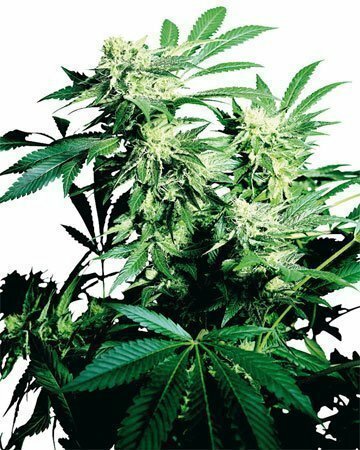 great place to buy seeds from great quality with top notch customer service!!! will be buying more! A great strain of mj with solid sativa properties that get you in the mood to tackle your to do list and get stuff done! Had great success with my seeds, got all 3 to germinate and ended up growing three big beautiful plants right in my backyard (I have the right growing climate) walking away with nearly 800 grams and smoking on the daily. I find it both energizing and relaxing for the body, good for creativity and socializing but I probably wouldn’t smoke too much before bed. All seeds sprouted within a couple days. Nice consistent growth between the seeds I ordered. All bushes over 4′ outdoor after the first month flowering. I will defiantly be buying these seeds again!! Great Tasting with a long lasting effect! 5 Stars even though only 3 seeds out of a 5 pack sprouted! 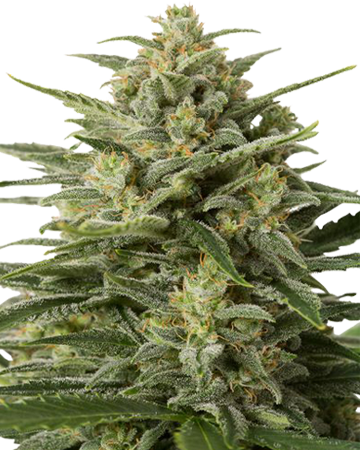 This is def one of the best hybrid strains you can buy and I love that I know this is where to buy the best feminized cannabis seeds. White widow is really just like its name. The high kind of creeps up on you like a spider, rather than just hitting you all at once. Then you’re kind of caught in this crazy good high. I took too much the first time and couldn’t really remember anything, so be careful with how much you take. Would really encourage everyone to add this to their gardens. You can tell this one’s pretty high in THC, but you won’t hear any complaints from me! 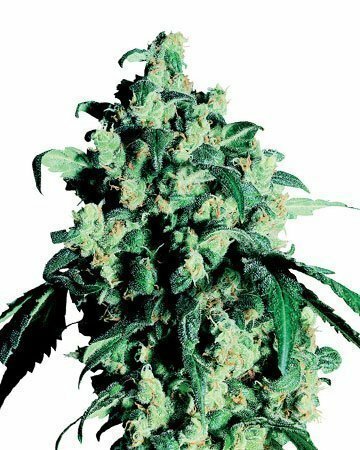 If I need a little boost in energy or in mood, then I always go for White Widow. I’ve grown a couple plants before so I thought I’d upgrade my set up to a hydroponic environment, and it worked great. As always, I’m so impressed and happy with Growers Choice! 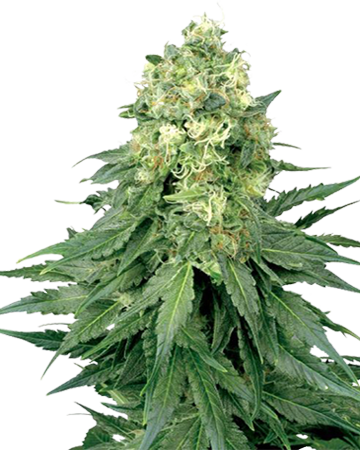 The prices are great, delivery is quick, and the feminized cannabis seeds always arrive in the best shape! 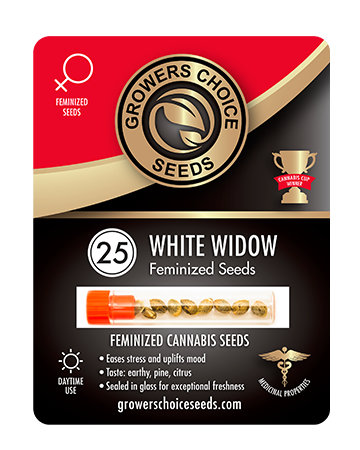 I tried out White Widow because the feminized cannabis seeds were on sale and I wanted to try something new and I do not regret it. It’s a great mind high that mellows out smoothly, offering the best of both worlds in terms of effects. I probably wouldn’t recommend these seeds for beginner growers, unless you’re ready to invest in a good set up, but if you’ve already had success growing a few plants then you should definitely give these a try. You don’t need me to tell you that White Widow is great cannabis, but I had some trouble ordering from Growers Choice the first time around. There was a mix up with my credit card and then there was some miscommunication. It all got sorted out pretty quick but it was a bit frustrating because I had to wait an extra two weeks to get my seeds. 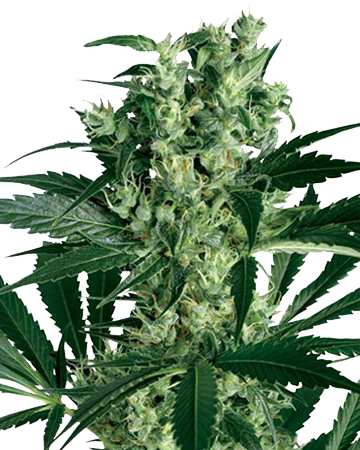 First world problems, at least I can buy cannabis seeds online, I know but when you’re paying good money – these seeds don’t come cheap – you kind of expect the service to be there. At least the seeds were in good shape when they got here, shipping didn’t damage the packaging and they looked fresh. I’m hoping my next order is a bit smoother than the last. If so, I’m sure I’ll keep ordering from here, though the end result is what I’ll base my decision off of. Excellent! Bought 5 seeds all did great in my hydro garden. Great yield, great bud and great buzz. Couldn’t be happier. Reordering today. Thanks for your review – hope you have fun growing, and keep us posted! White Widow is already one of my go-to strains, it’s got a good kick from the THC but also a really nice, relaxing finish. I’d say it’s one of those middle-of-the-road strains for when you kind of want to be happy but also you don’t want to be bouncing off the walls or anything. When you get the growing just right, it can be super sticky, which is awesome for obvious reasons. So far, I haven’t had a single problem with my seeds from Growers Choice. 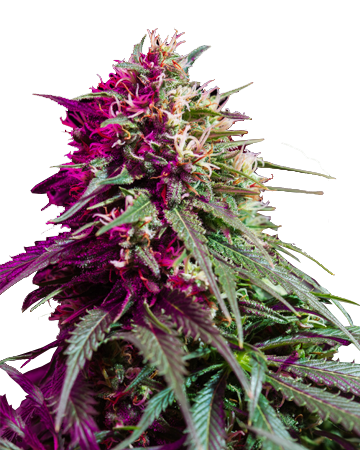 They have always arrived in great shape, which is kind of amazing since they’re coming from Canada, and they germinate quickly, which I can’t say for every dealer I’ve shopped with. 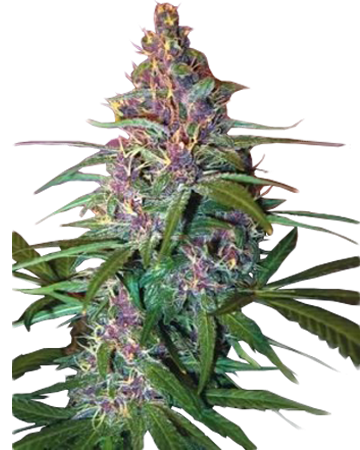 I’ve only grown mine inside, I like to have complete control, and for feminized seeds you get some beautiful plants. It feels like they take a bit longer but its definitely worth the time, I haven’t been disappointed. I have a curved spine, and this stuff is the best for managing the pain. My brother actually grows it for me, and he says it grows like a dream indoors. I usually order seeds only once a year, and since they’re feminized cannabis seeds I get way more out of them. I was pretty surprised after ordering online that the quality was so great, but I never buy from anywhere else even though a lot of stores have popped up since it’s been legalized in my area. Delivery gets to me on time, so I’m never worried about whether I have to track anything down. I get wicked cramps during my time of the month and I read that white widow can really help. Haven’t actually tried it yet, but so impressed with the professionalism of the company. Called in to ask about white widow and they gave me a list of other options. After reading up on the strains, I decided these ones would be best. They also explained what feminized cannabis seeds were, which I didn’t know about. They’re still in the flowering stage, but this marijuana smells pretty awesome. Whole experience has been awesome! My friend recommended this company, and I wish I listened. I went and ordered about $200 worth of seeds from another company and more than half of them were garbage. My friend bought seeds from here and all of his plants grew way bigger than mine and have higher yields. 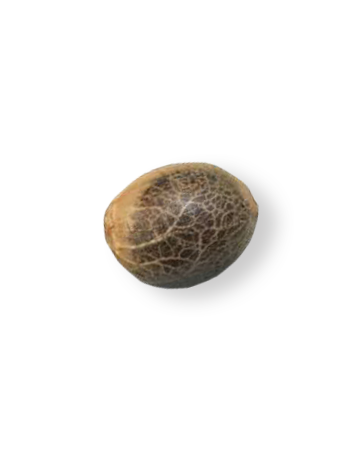 i just bought white widow, which i’ll be growing indoors, and they’ve already germinated. So happy I finally decided to buy, and feminized cannabis seeds are the bomb! Picked some White Widow seeds up because I liked your note about how it would grow well in a hydroponic environment without soil. I’ve always read such good things about growing that way, so I had been wanting to start. This was a perfect first seed to try, and my grow went well. There were a couple hiccups along the way, as it was all new to me, but the plants did their thing and I ended up with a great harvest. The weed itself was lovely, and it made me feel good. Great pick me up on days when I need it. 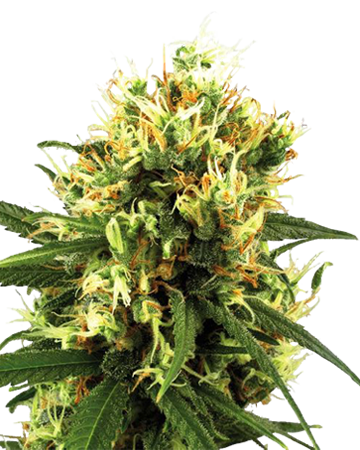 It’s great to see all the deals on the site, nothing wrong with getting some cheap seeds! I usually stick with evening strains since I find sativas give me a wide range of effects, but I think I will start using this strain when I’m feeling a bit sluggish during the early parts of the day. Just enough energy to feel the boost, without any buzzing or twitching like caffeine will sometimes do to me. Definitely a big plus in the stress relieve column here, too, which I need. I only planted one seed this time around, so I’m looking forward to cultivating the others. Feeling sad? You’ve defs clicked on the right seeds then! White Widow is my go to strain, because nothing makes me feel happier than hitting this. Smell is amazing, taste is amazing, and it’s such a smooooth smoke. 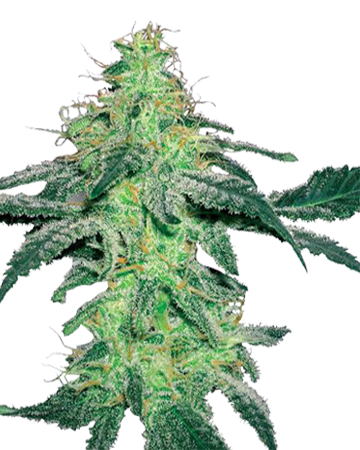 Easy to grow if you’re not used to growing, so all around it’s a solid choice for anyone, beginner to advanced. I’ve been buying it for awhile, but I’m glad I branched out in to getting seeds, because growing it myself was amazing. Big thanks to Growers Choice for converting me to seeds. I’m a dedicated customer now! These seeds germinated pretty fast, and were easy to grow. I love the smell and taste of the flowers. It’s great for a low-stress pick me up if you’re in pain but don’t want to feel super sleepy. I could see the quality as soon as the glass vial arrived. Even the seeds themselves are pretty. Great seeds! The germination and growing were both pretty easy. the White Widow is extremely potent for relaxing me. A couple of hits and my worries all about vanishes. Thanks Growers Choice. The seeds were here pretty fast and the quality was top notch. I always reach for some widow when I need a little pick me up and it never lets me down. 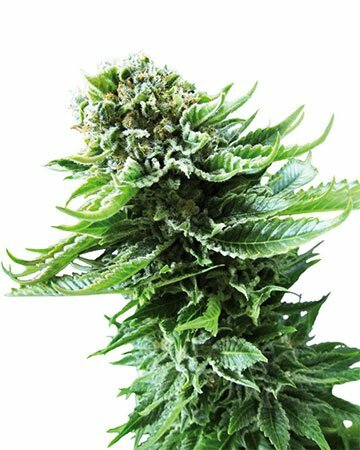 Amazing strain if you’re looking for a little jolt to get through a drowsy patch in your day, you will feel the effects almost immediately. Another great experience with Growers Choice, will order again. I always pick something with “white” or “widow” in the title when I choose marijuana, and these seeds grew some of the better hybrid buds I’ve sampled. I felt the high THC kick in pretty quickly – I was a little worried that all the resin would make this strain too mellow, but it was a perfect balance and just what I needed. I grew these seeds indoors, in soil, and didn’t have any problems. I’d buy these again.